EG: Tell us about yourself, Rachel. Anything you want to share is great. RH: I am a working author, which means I live on deadline. I write a book only to rewrite the book. By the time that’s done, I’m a month away from the hard-start of the next book. Yet somehow it seems the books take forever to release! But I love my job and despite the fact I feel like an eternal college student on the quarter system, I wouldn’t want to do anything else. My husband tolerates the writer’s life well and when I’m not writing, I lead worship at our church. I also watch a lot of sports. EG: What inspires you to write? Tell me about where and when you write, what you like to write about, etc. RH: Good writing inspires me to write. When I’m stuck, I pick up Susan May Warren, JoJo Moyes, Kristen Hannah, or Beatriz Williams. I read books with emotion and heart. Of course, nothing beats a good prayer meeting to stir the heart creatively. I write in my office—a lovely space built and designed by a former Pixar artist. As much as we all want to feel inspired and bubbling with creativity every day, most of us don’t. I don’t. So I head up to my office and work. No matter what. I have a goal for each day and work until I achieve it. Of course, life gets in the way and I have to make adjustments, but I do all I can to stay on track. Most of my stories are romantic, dual time stories. I love blending the story of characters from the past with characters in the present. EG: How did you get started writing professionally? Tell us about your journey. RH: I always wanted to be a writer since I was a little girl. I used to tell people I wanted to write children’s books. Then I realized the skill required to produce a good children’s book! Ha! On my first wedding anniversary the Lord prompted me to quit my job. My husband came to me a few days later and said he felt like I should quit my job. He had no idea what I was thinking or feeling. For the first time since I was 14, I wasn’t working or in school. Christian fiction was booming in those days so I read a lot. Eventually I started an epic WW II novel that was well rejected. But my “career” had started. I ended up back at work, putting a pause on writing. But in 2004 I quit for the last time to write full time. I’ve been published ever since. Praise God. Scene Tension Equation – Tension is what keeps the readers turning the page. Whether writing suspense or romance, the scene tension equation will help you make sure every scene is focused and on point. The Story Equation, 2-part workshop – Are you overwhelmed after learning so many new techniques and ideas? Are you struggling to know how to implement them into your novel and your publishing strategy? How do you take everything you’ve learned and create a brilliant novel? New York Times and award-winning author Rachel Hauck uses the Story Equation method to give you a tool belt of how-to tools, perfect if you’re a plotter, pantser or somewhere in between. You’ll learn how to build and weave your external plot with the characters’ internal journey to create an exciting, well-paced story. For beginning to advanced writers. Come to this year’s Renewal to hear more about Rachel’s work and be inspired to continue the pursuit of your own writing journey! In addition to writing and editing a monthly lifestyle newspaper for 10 years, Elizabeth Griffin has published more than 500 articles in newspapers, anthologies, and magazines, along with the books Fragile X, Fragile Hope: Finding Joy in Parenting a Child with Special Needs and Margot’s Story. Elizabeth’s favorite subject matter is true stories of redemption. She loves to speak truth into the lives of others and has been a Bible teacher for 16 years. Her recent adventures include directing communications for an international missions group and public relations for Seattle’s Union Gospel Mission, and blogging at Follow the Dots. The gifts Lisa Mitts brings to this year’s conference as worship leader have come at great personal cost. She is a survivor of trauma. When she was 24, a stalker assaulted her at knifepoint in her own home. Lisa is convinced that her life would have ended had it not been for a miraculous intervention. She heard a voice telling her what to say to the man. The words that tumbled out of her mouth caused the attacker to leave while she was still alive. She admits that for many years, even after becoming a believer, she couldn’t speak about the attack because she still needed deep healing and freedom from shame, anxiety, and the fear of death. Lisa’s salvation experience took place two days after her husband, David, gave his life to Christ at a 1988 business convention in Miami, Florida. The couple now supports each other in ministries of healing as David practices holistic medicine and Lisa works with victims of human trafficking. Together they established the Seattle chapter of The Defender Foundation, as well as founding Destiny House Restoration Center, a rehabilitation facility for rescued victims. Lisa Mitts and Dr. Stacy Cecchet, a psychologist, professor, and consultant to the Seattle Police Department and the Washington State Congress, have developed the breakthrough program, H.E.A.R.T.S (Healing, Education, And Restoration Treatment for Survivors), used at Destiny House and other centers. David and Lisa are also the founders and senior pastors of One New Man Ministry in Renton, Washington, where, as Jewish believers, they instruct their congregation on Christianity’s Hebraic roots. David has written three books on the subject. The depth of compassion and understanding that Lisa has for traumatized people, along with her own personal healing, add to the richness of her worship of the King of Kings. She began her musical journey at age six when she started taking piano lessons, and she applied herself to the study of music. At the University of Florida, she chose music as her major. But after just a year, she realized she didn’t want to be a classical pianist and went on to earn a degree in journalism and communications and broadcast production. For a brief time she worked at the NBC affiliate in San Francisco. Today Lisa has returned to her musical roots and is a worship leader, singer, songwriter, and recording artist. Her passion against human trafficking is expressed in her song “Where Has Love Gone?” In September 2015, its music video was awarded Best Music Video at the Awareness Film Festival in Los Angeles. She is currently working on her fifth CD project with the hope that it will reach hundreds of thousands of listeners to bring healing, encouragement, and a more intimate relationship with God. The Heart and Technique of Writing Song Lyrics – Discover the art of writing powerful song lyrics, especially for the genre of contemporary Christian music (CCM). In addition to the basic structure of a good song, also covered will be the importance of combining passion, emotion, and personal testimony with the foundations of God’s Word and message for all His children. All class participants will have the opportunity to write their first song or improve their lyric-writing skills and share with the class. No prior musical or songwriting experience is necessary (all levels). Register today to attend Lisa’s workshop and be blessed by her leadership in worship and compassion at this year’s Renewal. From the moment she could speak, Jennifer Slattery loved words. In fact, her mother used to beg her to be silent—just for five minutes. But Jennifer couldn’t do it. Even when disciplined by teachers for talking in class or embarrassed in Bible studies for dominating the discussion, her natural propensity for self-expression would not be dampened. As an adult, Jennifer’s wellspring of words has become a source of healing to many women. She began Wholly Loved Ministries to teach women the truth about who they are as daughters of the King. Through stories and humor she shows women how to tune out the lies promoted on social media and modern culture, and to tune into the truth of God’s Word and their identity in Christ. In addition to speaking fluently, Jennifer also has a freely flowing pen, and she has published five Romance novels with New Hope Publishers. She is a regular contributor to Crosswalk.com, Internet Cafe Devotions, and Christians Read. As managing editor of Guiding Light Women’s Fiction, an imprint of Lighthouse Publishing of the Carolinas, she loves working with writers to help them strengthen their manuscripts and grow in their gifting. At the May 5–6 Northwest Christian Writers Renewal, Jennifer will entertain proposals for Guiding Light Women’s Fiction. Because we’re so close to the conference, she will schedule her own appointments. You may e-mail her to request a 15-minute slot, or you can use the sign-up form at the Editor/Agent Appointment Desk. In looking for women’s fiction, Jennifer is especially interested in manuscripts that can cross over into the general market. Though the publisher will continue to release novels with strong Christian elements, for this imprint they’re looking for stories that don’t necessarily use Scripture or refer to God but that reveal truth in more of a parable fashion, such as showing the consequences of sinful behavior. She is not interested in seeing nonfiction, children’s, YA, or overtly religious women’s fiction. At the conference, let Jennifer’s God-given gift for self-expression inspire you to develop your own way with words. Sign up now for the 2017 Northwest Christian Writers Renewal. We all know at least one Wonder Woman. Or we’ve heard of one. Because whenever a woman manages to parent more than a couple of children w ell, earn an income, actively minister in her church and community, and juggle a host of activities and relationships, word spreads. With Tricia Goyer, you can multiply all of the above many times, and word has definitely spread. To say that she is a busy mom of ten is an understatement. Her list of accomplishments and ongoing ministry is astonishing. Jesus’ parable of the talents, told in Matthew 25:14–30 (esv), comes to mind when I think about Tricia. The Lord has definitely given her many abilities and gifts, and she has been faithful to use them. As she has done that, the promise “For to everyone who has will more be given, and he will have an abundance,” has proven true. Writing for me comes down to two things: (1) the choice, and (2) deadlines. I have deadlines with publishers that I have to meet, and I have to make hard choices to meet them. I often wake up early to write—like four a.m. I take my computer with me when we have appointments, such as speech therapy and occupational therapy, and I write in the waiting rooms. And I hire a babysitter for eight to ten hours a week to watch my kids so I can write. Of course that means ignoring the laundry, ignoring the messy house, and ignoring all the things I want to watch on television. Sometimes I’m tired when I sit down to write, but once I get going the ideas excite me, and it becomes easier. The hard part is just getting started. I’ve learned over the years to just start. That’s a good lesson for all of us: just start. Be faithful with what God has given you. Then praise him for the results. Don’t miss meeting a real-life Wonder Woman! Sign up now for the 2017 Northwest Christian Writers Renewal. The first time I went to a book launch, I wasn’t sure what to expect. My family arrived at the Burien Public Library a little late and found a crowd packed into the expansive meeting room. That book launch debuted Sonja Anderson’s novel, Sophie’s Quest. The first thing you notice about the book is the beautiful cover art depicting an owl wearing a purse and hat, soaring over a sunny harbor. As you read, you find that it deals with deep questions of faith, culture, and the differences that often divide us. It does this all in a way that is accessible and engaging for young readers. For an aspiring novelist, the story of how this book and its sequel came into being is as uplifting as the adventure itself. Sonja Anderson loves books. She is a multi-published author, an educator, and a librarian—the perfect vocations for a book lover. Her love of reading and teaching has taken her many places. In Chicago, she studied history at North Park College. At Harvard University in Boston she earned a Master of Education degree. In Tokyo she taught kindergarten and second grade at an international school. Since coming to Washington State she has taught every grade as a substitute teacher in Seattle Public Schools, and for twelve years she served as the Christian Formation Coordinator for the North Pacific Conference of the Evangelical Covenant Church. She is currently the library tech at her local elementary school where she helps children find books that will ignite their own passion for lifelong reading. Sonja Anderson is also an active member of the Society of Children’s Book Authors and Illustrators and of the Northwest Christian Writers Association. At this year’s Northwest Christian Writers Renewal, Sonja will share her insights in two break-out sessions for emerging writers. Don’t miss hearing Sonja Anderson at the 2017 Northwest Christian Writers Renewal. Sign up now! Eric Gollings, a humanitarian professional with an MBA, is fluent in Spanish, Chinese, and English and has spent years living and serving in Latin America and Asia. For the last eight years, he has worked for World Vision. His writing and speaking interests include history, theology, humanitarian affairs, and speculative fiction. Eric enjoys creating clear and compelling communication, whether through blog posts, stories, professional e-mails, or speaking engagements. Devotions every day? The struggle is real, according to editor Courtney Lasater. Perhaps that’s one reason why Courtney is so passionate about sharing the gospel through Keys for Kids, an online daily devotional ministry for children ages 6 to 12. As editor at Keys for Kids for the past four years, Courtney loves pointing children to the truth of the Bible—that Jesus loves them, he died for them, and he can be trusted because he is more than enough! The roots of Keys for Kids Ministries date back to 1947, when a radio program called the Children’s Bible Hour began. This popular program featured radio dramas that spread the message of God’s love to kids around the world. In 2014, the ministry’s name was changed to Keys for Kids, which more accurately reflected their mission: to ignite a passion for Christ in kids and their families. And exactly what is Courtney looking for? Devotions for 6- to 12-year-olds with a strong biblical message; children’s or family activity ideas; nonfiction books or web content for children, teens, and/or parents; and Bible studies for children or teens. Devotions must follow a specific format, as explained in the Keys for Kids guidelines. What is Courtney not looking for? Picture books, children’s/teen/adult novels, or adult nonfiction books (other than parenting). Don’t miss hearing Courtney Lasater at the 2017 Northwest Christian Writers Renewal. Sign up now! Nancy Aguilar has worked as an editor for YWAM Publishing, George Fox University Seminary, the Word for Today, U-Turn for Christ, the Enduring Word, and others. Her writing credits include Clubhouse Magazine, Upper Room, and Heavenly Company: Entertaining Angels Unaware. She teaches in the women’s Bible study at her church and has also taught for Calvary Chapel Bible College. Nancy leads a lively critique group and is currently coauthoring a getaway guide for writers. Those who attend Northwest Christian Writers Association meetings regularly know that longtime member Amy Letinsky is a critical thinker, crazy about metaphor, and an avid reader and writer. Q: What roles have you played in NCWA? A: Several years ago I let then-president Dennis Brooke talk me into taking on the secretary role at NCWA, and it was a great learning experience. Then I coordinated public relations. And I’ve had several opportunities to teach Write Start and Christian Writer’s Coach segments and lead round tables at the monthly meetings. I’ve also led round tables at the conference a few times. Q: Who are your favorite writers—the ones you believe we all must read and the ones who have influenced you most? A: Yikes, that’s like asking me who is my favorite child. John Milton’s Paradise Lost has been, next to the Bible, the most influential book on my life. Milton’s brilliance in all his writing has greatly contributed to my worldview, challenged me to be a deeper thinker, and encouraged me to boldly involve Christ in every aspect of my writing. Yes, he wrote in the seventeenth century, but his writing is still very relevant, beautiful, and worthwhile for every reader to approach. John Bunyan is another favorite for the Christian reader. I’ve had the privilege of teaching Pilgrim’s Progress a few times, and it’s always been an extremely enriching experience. It’s far less intimidating than Paradise Lost, but it was written in the same time period. Bunyan is the opposite of Milton in many ways. Whereas Milton was highly educated and upper class, Bunyan was very poor, with limited education. Both men fought in the same war for puritan ideals, and both went to prison for their beliefs. Bunyan inspires me for what Jesus can do with so little, and Milton inspires me with what Jesus can do with so much. Bunyan’s suffering comes across in his work like no other writer I’ve encountered. I think Marilynne Robinson is woefully under-read by Christians. She’s won the Pulitzer Prize and regularly teaches at the most prestigious writing program in the country (the Iowa Writers Workshop). She writes about spiritual issues and is a devout Christian. Many consider her to be our greatest living American writer (I concur). Gilead is her masterpiece. Her prose reads like poetry. Q: What intrigues you most about metaphor? A: I’m a metaphor buff. I collect them, study them, and wish that I could be better at writing them. Metaphor, to me, is the core of language itself. Every word we speak is metaphoric, in that it stands in for something else. When I say the word “baby,” the word itself isn’t a baby; the word refers to or stands in for the crying, diaper-wetting, adorable little mess of cute. Some words carry more metaphorical weight than others. They become powerful symbols. Words like “freedom” and “rights” carry meanings that, interpreted differently, can start wars or end them. As Christians, we serve a God who uses many beautiful metaphors to describe himself and his kingdom. Jesus employed metaphors in his parables. He is the Good Shepherd, and we are his sheep. He is the Gate. He is the Rock. The greatest teacher chose metaphor as a primary way of communicating truth to his followers. To me, that’s the greatest reason of all to pay attention to metaphor. Q: What do you enjoy most about teaching? A: I teach in a lot of different capacities: Sunday school, Girl Scouts; I teach writing to professionals and at NCWA meetings and at Champlain College in the Continuing Professional Studies department. I enjoy teaching all of these levels, but my passion is teaching grownups to read and write. For me, it’s a high calling to train people to think critically and express themselves effectively. I can think of very few life skills that can make such a big difference in people’s lives. Reading is so much more than sounding out the words on a page. When reading at a high level of critical depth, you avoid falling victim to fake news and scammers, you can discern truth vs lies, you can make connections between ideas to see the big picture, and you can find answers to difficult questions. When I speak to professional writers, the audience already recognizes the importance of writing. But in my college courses I spend much of my time convincing students that writing is important, that good writing is within their grasp, and that it’s worthwhile to invest time and energy into becoming better at it. So much of their lives involve writing, and yet they don’t realize that their inter-office emails and reports count as writing. I also enjoy teaching students the ethics of writing, and the obligation they have to share information and persuade in an honest way for their particular audience: to speak truth in love. Q: What are the most important things a writer can do to improve his or her craft? A: “Keep writing.” That’s the advice that Khaled Hosseini, author of The Kite Runner, gave me when he came to speak at the college where I was teaching at the time. At first, I felt like he was kind of brushing me off. But I’ve come to realize that it’s the best advice for becoming a better writer. Marilynne Robinson, whom I’ve mentioned above, had very different advice for me. She said, “Feel the difference between what you’ve experienced and what you’re writing and fill in that difference.” I’m still untangling what that means. As far as practical advice, I advocate reading a lot. To be a good writer is to be a good reader and vise versa. Read good stuff. Read stuff that challenges you, has won awards, and that may not fit with your worldview. Remember: Garbage in, garbage out; Quality in, quality out. Okay, I’m a writing instructor, so here’s another tip: Write in your books. Mark them up as much as possible. Use a pencil or pen, and argue in the margins. Begin your essay at the end of the paragraph, continuing the line of thought. Circle key points. Fully engage with the text to learn it and apply it in your writing. Q: How do you balance your career with being a wife and mother? A: Not well. As my kids are getting older, I’m getting better at it, but it probably has to do more with them getting older than me figuring it out. I have a strong sense of calling to my career as an instructor and my role as a stay-at-home mom. These two things love to compete with each other. But I have a supportive husband who helps watch the kids, so I can work. My husband is a physician, so he understands the time and mental commitment required for in-depth study. I think he also enjoys how fired up I get about my teaching and writing. Really, it’s God’s grace that I’ve managed to keep working, stay married, and take care of the kids. I’m not exactly sure how I’ve managed it, but God keeps making it possible. He’s perfectly timed my huge writing projects to when I can get more help with the kids. And God gave me kids that generally sleep well, which is a huge help. Register today to attend Amy’s workshops at this year’s Renewal. 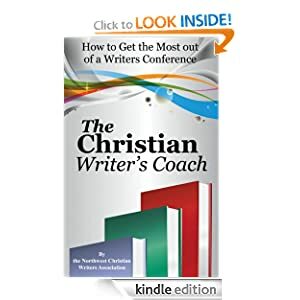 Visit The Christian Writer's Coach's profile on Pinterest. Lynn Severance/Let All Creation Sing!